A Northumberland Air Cadet Officer is retiring after notching up 20 years continuous service with Durham/Northumberland Wing ATC. Flight Lieutenant Bob Donothey joined 242 (Cramlington) Squadron in 1996 as a Civilian Instructor, and 4 years later was commissioned into the Royal Air Force Volunteer Reserve (Training Branch). He took over as Officer Commanding 404 (Morpeth) Squadron in February 2002 – a position which he has held for 14 years. In that time, Bob has ably led the Squadron through significant development, ensuring that his Cadets and Staff have had access to exciting opportunities and challenging training. Those opportunities offered to the Cadets by Bob and his team included overseas trips to Crete, where Cadets were able to undertake challenging expeditions in unfamiliar surroundings, and to France, where Cadets helped to commemorate the 65th Anniversary of the Normandy Landings. Flt Lt Donothey’s commitment to the organisation and to his Cadets has been recognised through the award he has received, which include a Cadet Forces Medal, a Lord-Lieutenant’s Certificate of Meritorious Service, and a Good Service award from the Commandant Air Cadets. One of the highlights of Flt Lt Donothey’s career was undoubtably the selection in 2014 of one of his Cadets as the Best Female Cadet in the Air Training Corps. Bridget Donaldson, who was 18 at the time, was presented with the prestigious Dacre Brooch. Bob’s commitment to encouraging his Cadets to achieve at the very highest level in all areas of the Air Cadets was a key factor in her success. At the time of winning the award, Bridget had already racked up a Gliding Scholarship, Flying Scholarship, and Gold Duke of Edinburgh’s Award. 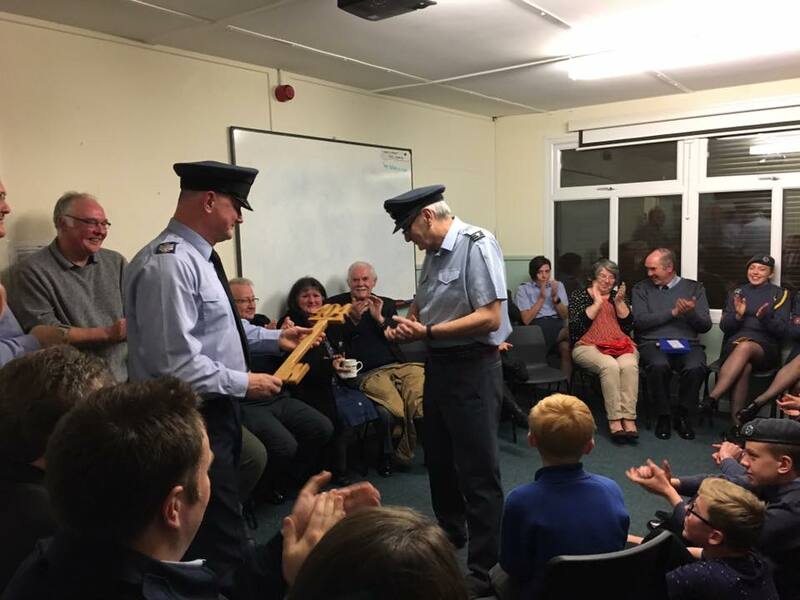 Flt Lt Donothey handed over to his successor, Flight Sergeant Paul Davies, at a special evening put on by the Cadets and Staff, and attended by the Deputy Officer Commanding Durham Northumberland Wing ATC, Squadron Leader John Scott. “Flt Lt Donothey has given many years of dedicated service to the Air Cadet Organisation providing a vast range of opportunities for the young people under his command. The respect and high regard in which he is held is clearly demonstrated by the number of people who turned out to celebrate his final parade. He retires leaving behind a legacy in the local community that will endure for many generations to come marked by the continuing service and achievements of all those young people on whose lives he has had such a positive influence,” said Sqn Ldr Scott.